Our 2019 memberships are now open with closing date for memberships 31st March. Our core membership has not changed in over 15 years. Although our costs have increased year on year for costs across the club such as Insurance both public and team, membership to governance bodies GAA and Ladies GAA and fees, team expenses ie winter training costs and general costs to field teams. In alignment with our 5 year strategic working plan. A review of our current membership levels and membership options available was undertaken over the last number of months in 2018. The approach which was taken was to review in line with our financial commitments as a club and how we compared to comparative geographical and similar demographic GAA clubs. As a result it is now is the time to make some strategic changes to our membership offerings. Which are outlined below. Subscription membership to allow adult teams play their weekly subs in advance and online thus reducing admin overhead on management teams. Increased Family Options to accommodate for increased membership options. Membership discount is applied based on 10e discount applied to every other subsequent membership – Original discount is applied to all memberships within package. 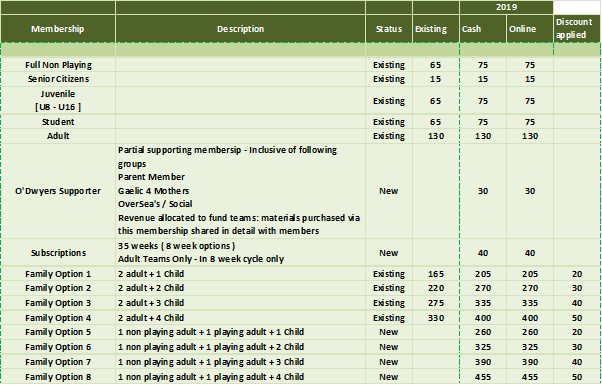 Partial membership for Juvenile members in order to allow us to sign up new players during the season. Membership can be paid through a secure online partner Clubforce (formerly My Club Finances) where total fees can be spread over 3 months. Membership can also be paid or membership plan be made during registration weeks in the club via our membership team. 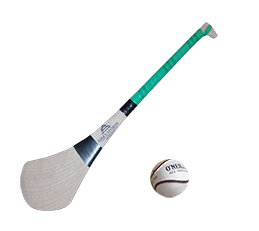 Cover via GAA player injury fund while training and playing matches. Access to membership discount scheme [10% McFadden’s, Discounted membership to Platinum Gym Balbriggan] – Further scheme offerings will be confirmed over coming weeks. Cover vis GAA player injury fund while training and playing matches.